Looking for a quick and easy one sheet meal? 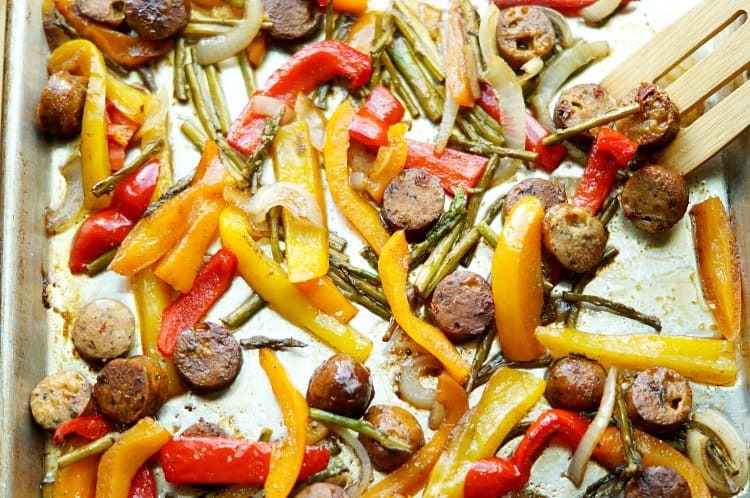 This Sheet Pan Sausage & Vegetables with Parmesan is the perfect weeknight meal. 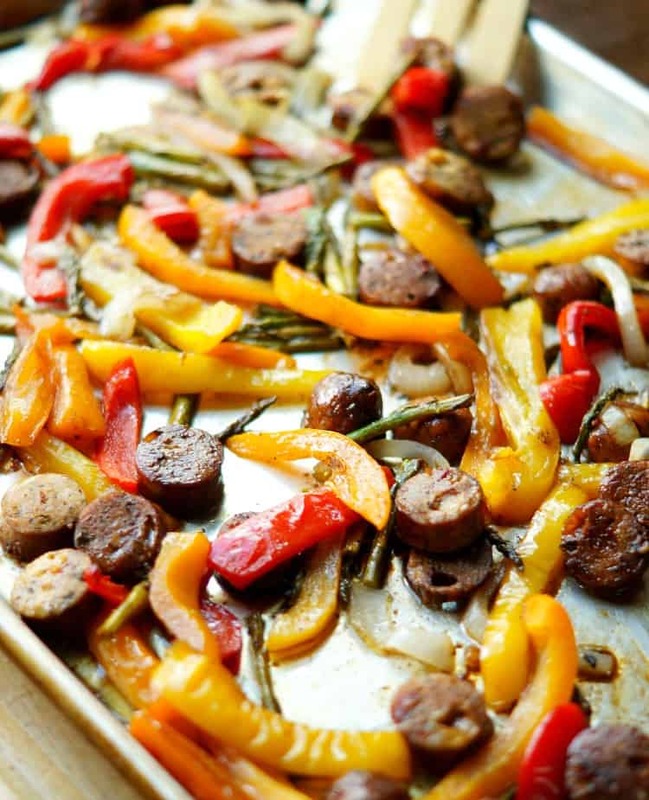 Sheet Pan Parmesan Sausage and Roasted Vegetables is an easy, one pan dinner that is healthy and full of delicious flavors! Hi everyone! Amanda here from Old House to New Home sharing what has become my new go to dinner! I go through stages where I find an easy and flavorful dinner that everyone loves and make it weekly. 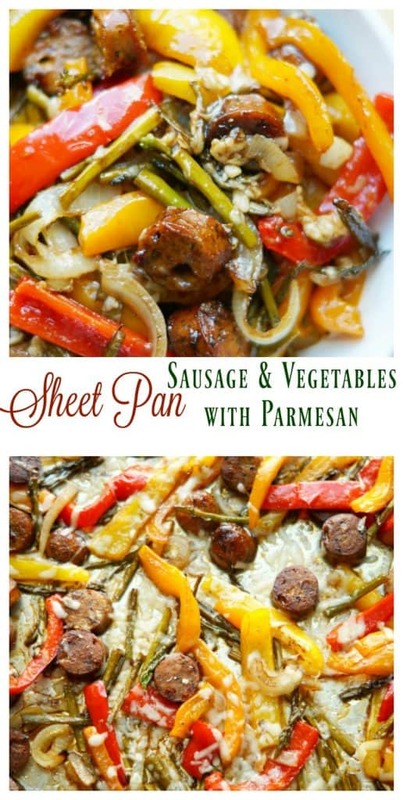 Previously, it was our favorite shredded brussell sprout and bacon rigatoni, but this sheet pan parmesan sausage and roasted vegetables is quickly taking its place! This dinner is SO easy! Everything gets thrown on one sheet pan and baked. 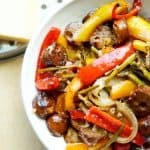 Other then slicing the peppers and onions, it seriously doesn’t require any effort at all! Not only is this dinner easy and delicious, it is healthy! 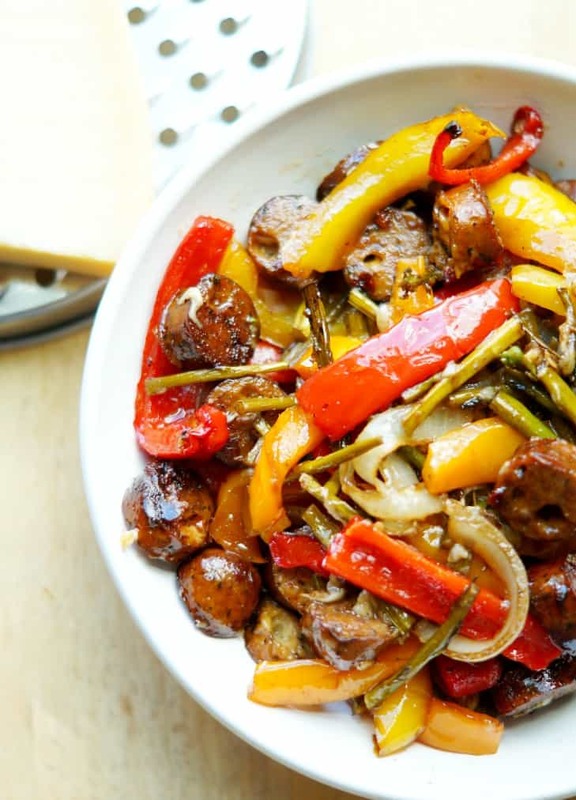 I use chicken sausage for this recipe and then you get tons of veggies a long with it. I used three colors of peppers, onions, and asparagus for this one, but you could throw on any vegetable that you have sitting around in your fridge. Zucchini is one of our favorite vegetables and it would be delicious in this recipe! Both of my daughters (even the baby!) love this dinner, so it is definitely kid friendly! I used a tomato basil chicken sausage, which is nice and sweet, but if your kids like spicy foods, you could definitely substitute a spicier sausage. You do want to choose a sausage thats already cooked, not raw, though. The sausage gets so crispy and brown from cooking on the sheet pan and the flavor from the balsamic vinegar as it caramelizes is so good! I top the whole thing off with lots of freshly shredded parmesan! Sweet from the balsamic and salty from the cheese! I don’t know about you, but nights are crazy right now with soccer practices and swim lessons and early baby bed times, so any dinner that I can make quickly and without much effort is definitely my favorite type of dinner right now! You can honestly make this dish quicker than it would take for delivery to get to your house! I know your family will love this easy dinner and I hope you do too! 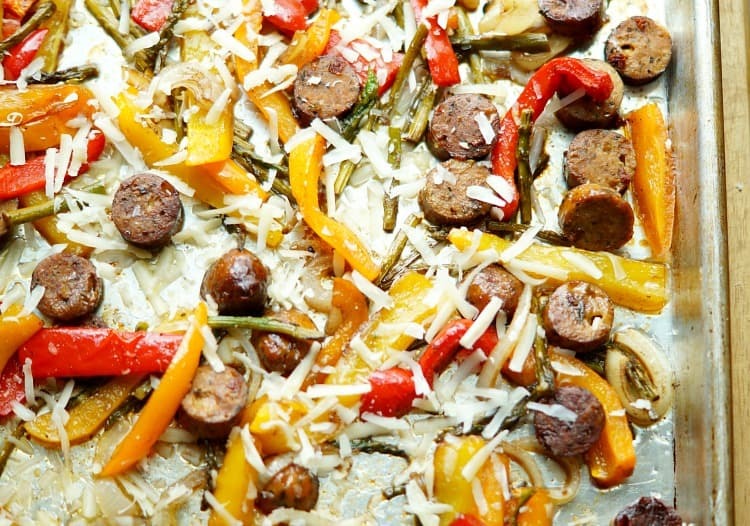 Sheet Pan Sausage & Vegetables with Parmesan is the perfect weeknight meal. 1 lb asparagus diced in 2"
Preheat oven to 425 degrees. 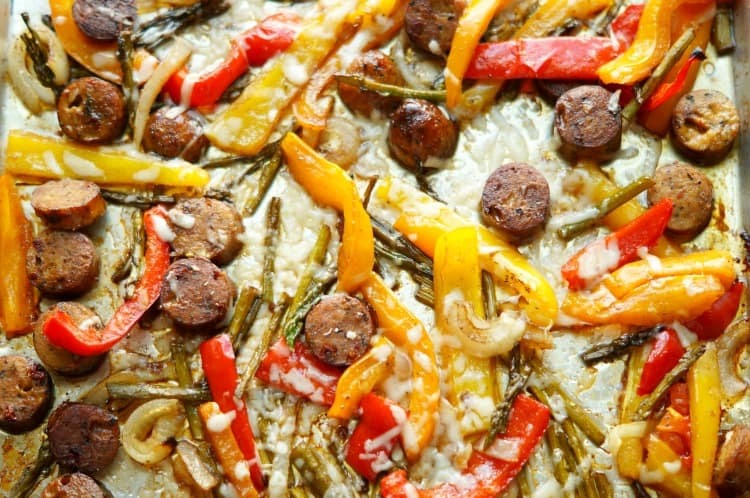 Drizzle olive oil on sheet pan and then place your sausage, asparagus, peppers, and onions on the pan. Drizzle balsamic vinegar over everything and season with salt and pepper. Stir to evenly combine. Bake for 15 minutes. Remove from oven, top with cheese, and return to oven for 5 minutes.